I hope the effects of eating too much turkey, or tofurky if you live in my house, and are ready to dive head first into the reading month of December. Last week the 7th/8th Grade Chapter of Guys Read met right before our long Thanksgiving Break and we had an epic Nerd Sport meeting. We have been reading and talking about The Iron Trial by Holly Black and Cassandra Clare, and if you remember back on November 19 we invented a game based on the Gummy Worm Attack launched by Master Rufus in Chapter 10. Well at last Tuesday’s meeting we had a full group of students and could actually play our version of gummy Worm Attack! The game ended in an 18 to 18 tie, so we had to go to penalty shots and found our epic nerd sport, Gummy Worm Attack Champions. Check back in soon as we continue reading challenges and general reading silliness. Today is only Tuesday, but with the Thanksgiving break upon us, we decided it was close enough to Friday, so the 6th Grade Chapter of Guys Read had a meeting. We are beginning to do some work with the book Trouble Makers by the group over at Howtoons. Now the Howtoons creators have a great website, with most of the experiments from the book represented on the site. I let the lads loose on their website and asked what they might like to try. Between the videos and the just plain coolness of the cover they went with the Infamous Marshmallow Shooter. This post is to let the guys know what pieces they need to acquire before our next GR meeting (Friday Dec. 4). You can access the Howtoons site to see how it all works, but I have some pictures of the example I built for a grand total of $4.39 worth of materials from Lowes. What are we going to be doing with these launchers I can hear you all asking. Well I can tell you we will not be doing any sort of launching at each other. We do not need Marshmallows to the eye injuries. So we will be working with another new book called The Last Kids on Earth by Max Brallier. In the story a monster apocalypse has happened and ordinary Jack has to defend himself from all sorts of monsters and zombies. We will be creating monster targets and launching marshmallows at them to test our aim. If you just get the connector pieces we will have some pvc pipe at our next meeting. 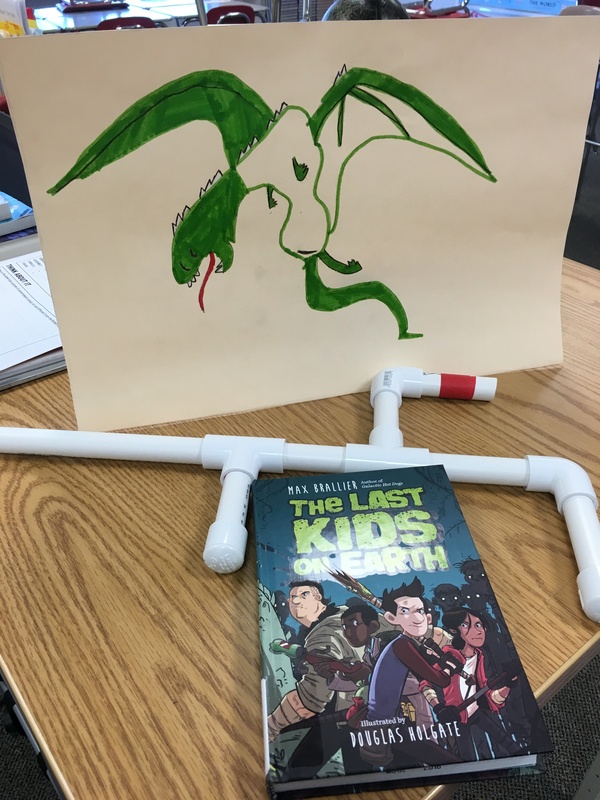 Go forth and build, and maybe check out The Last Kids on Earth by Max Brallier. Yesterday The Inklings met to continue to discuss The Map To Everywhere by Carrie Ryan and John Parke Davis. During this meeting we decided to focus on chapter nine and Fin’s escape from the Meressian ship and the guard called Bull Face. We liked this scene because it really is a great example of the whole tone of this great novel. It is full of action, wit, humor (Bull Face barfs right in the middle of the chase) and thrilling skydiving! So we came up with a Reading Challenge based on Fin’s flying suit. First we made models of Fin and his squirrel suit. Once we had the models built we went outside to see how well they flew. Today is November 15th and I am officially halfway through my NaNoWriMo adventure. Right now I have about 55 pages of my first draft. It has been difficult at times to stay motivated and find out where my story was going to go, but each day I have managed to hit, or come close to my word target. It is truly amazing how the words and the pages just seem to add up if you sit down and actually put fingers to keys everyday. If anyone is willing to give some of it a read I would love to hear what you think. So today was an interesting day at our 6th Grade Guys Read lunch meeting. We have been talking about Frank Einstein and the Brain Turbo and thought it might be fun to try a little taste experiment. So we took some our left over Halloween candy and found one piece that represented all four of the major flavors, then smashed them together. We then dipped the smashed candy ball into a soy sauce bath before eating. The soy sauce represented the fifth flavor, umami. 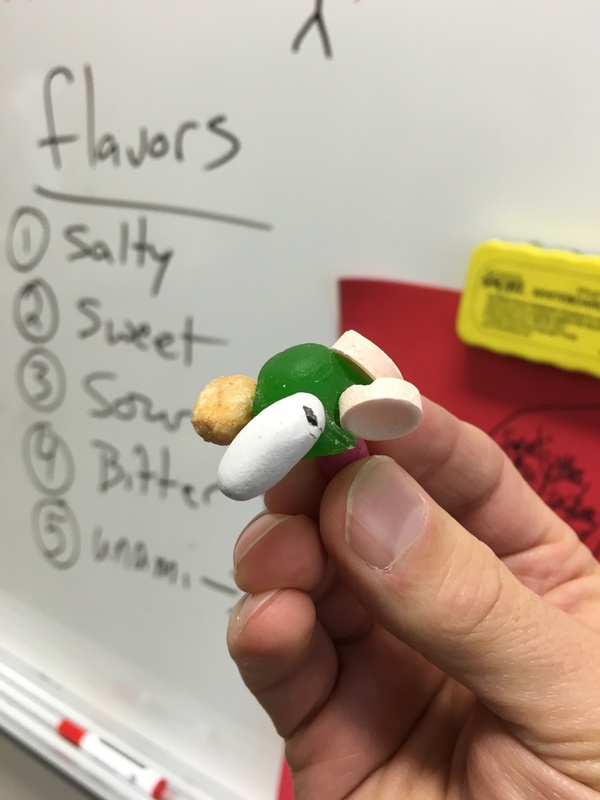 Last year we did a similar experiment based on Watson’s Peanut Butter flavored bubble gum. Go check that chaos out if you want a good laugh. @hutchinsonjm @Jon_Scieszka so very awesome! This week the 7th/8th Grade Chapter of Guys Read met with very small group of guys. Many of our regular members were either tracked out or on an overnight field trip. I wasn’t sure we were going to be able to complete the activity that I had planned, but actually it worked out pretty well. We have been reading The Iron Trial by Holly Black and Cassandra Clare. This week we took a look at the beginning of chapter 10 and gummy worm fight that Master Rufus starts as the William Tell Overture plays in the background. What a perfect scene for the SMS Guys Read treatment. So check out of Reading Challenge we called Gummy Worm Attack…. We took these practice runs to develop a complete game. All you need is a few friend, a cone, and lots of gummy worms (to both eat and throw). So why not read The Iron Trial and then find a few friends, a cone and a few bags of Gummy Worms and give Gummy Worm Attack a try. Here we are on the 9th day of NaNoWriMo and I am nearly 15,000 words into my story called Shadowtails. Why don’t you give the first few pages a read and let me know what you think. Remember this is first draft so be kind. Our Inkling book club has just started attacking the wonderful fantasy novel The Map To Everywhere, by sort of local authors, Carrie Ryan and John Parke Davis. In our first meeting we talked about the Orphan Preserve and introduced one of my favorite parts of the Khaznot Quay, Ad and Tad’s Gourmet Pie-o-ria. Now if you have read The Map To Everywhere you know that Ad and Tad’s is really just a front for a thieves’ den, where all sorts of nasties like to hang out. In that first visit to Ad and Tad’s we see a few thugs playing a game called Toss-The-Teeth. The authors give us no explanation of the the rules of the game, so we figured we would do them a favor and come up with said rules. Remember these are all just first attempts at creating a game of chance so they might be a little rough around the edges. What game idea did you like the best? Why not hit that comment button and let us know? We are planning on working out the kinks, building game pieces (if needed) and writing out the rules at out next meeting. Help us choose what game to develop. As you know it is now the grand month of November and that means NaNoWriMo! Today is only day three and you all have time to get with the program and write along with me. Take a look at the Young Writers Program, or just write a story… No Rules, Just Write. I have around 3,000 words done and I would love to hear what you think. Remember I am writing Shadowtails after your vote was counted. Shadowtails is the thriller based on the Washington DC Mall, with a presidential kidnapping, oh and all of the main characters are squirrels. So take a look at the first few pages and share your thoughts in the comments. Remember it is a first draft, so be kind with spelling and grammar mistakes.